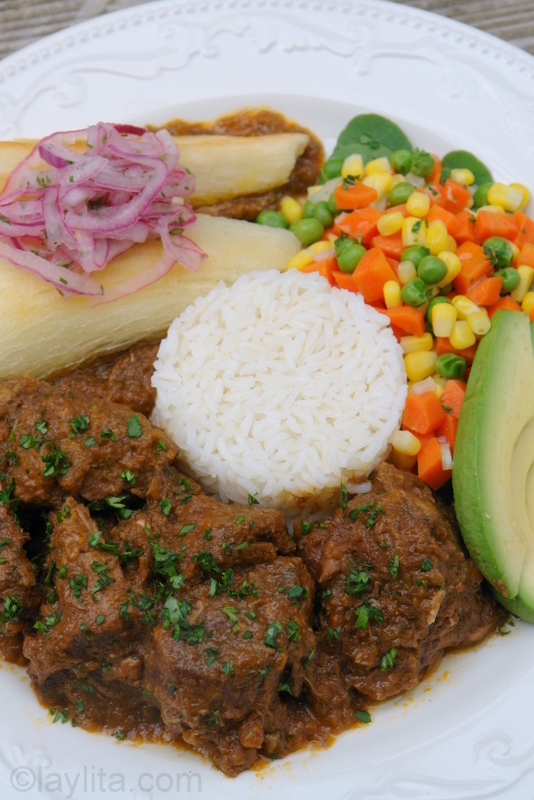 This Ecuadorian lamb stew, also called seco de borrego or cordero, is cooked slowly in sauce of beer, wine, garlic, cumin, achiote, oregano, peppers, onions, cilantro, parsley, tomatoes, and other spices. Secos are a type of stew and are very popular in Ecuador and other South American countries; these yummy stews are usually made with beef, goat, lamb or chicken; the meat or poultry is slow cooked in a sauce made from a combination of liquid like beer, chicha, fruit juice, or wine; vegetables such as tomatoes, onions and/or peppers; and various different seasonings, spices and herbs –garlic, cumin, coriander, achiote, cinnamon, cilantro, parsley, oregano, among others. 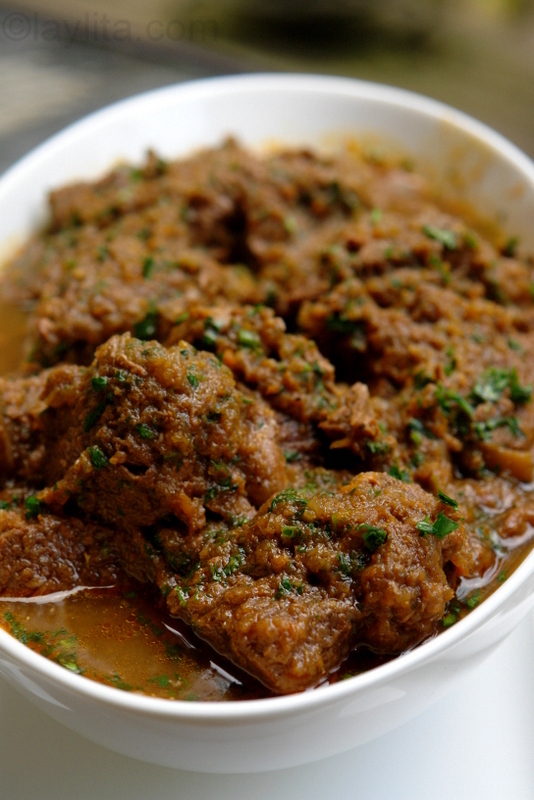 The exact ingredients and quantities vary from one type of seco to another, as well as from one region to another, but the goal is always the same: to obtain a delicious tender meat that falls off the bones (if the meat has bones) with barely touching it and melts in your mouth, all inside a very flavorful sauce that has slowly absorbed each distinct flavor to create one amazing taste. The preparation of these great stews is very easy and simple, the only thing you need is a little bit of time because they take several hours to cook. Ecuadorian lamb stew, also known as seco de borrego, cooked slowly in sauce of beer, wine, garlic, cumin, achiote, oregano, peppers, onions, cilantro, parsley, tomatoes, and other spices. Marinate the lamb meat in the onion marinade for a couple of hours. Place the onion, bell peppers and tomatoes in the food processor and blend until well minced. Heat the oil in a large sauce pan or soup pot. Add the minced onion, tomatoes and peppers, as well as the achiote and chili powder, stir and cook for about 8 minutes. Add the lamb meat, along with the grated panela, beer, wine, and naranjilla juice, bring to a boil. Reduce heat and simmer about 3 ½ hours or until the meat is very tender and the sauce has reduced and thickened, taste occasionally and add salt and pepper as needed. Serve with rice, yuca, onion curtido or pickled red onions, a small side salad, avocado slices and some spicy aji or hot sauce. Some alternatives to naranjilla juice (in case you can’t find it), include passion fruit concentrate (or juice, but omit the panela if the juice is sweet), tamarind juice or paste diluted in water, or even just a mix of orange juice and lemon juice. Seco de borrego, also known as seco de cordero, is very similar to seco de chivo or goat stew, in fact quite frequently the goat stew is made with lamb because lamb meat is much easier to find, but if you’ve tasted them both you know there is a difference; even if you use exactly the same vegetables, spices and liquids, the meat infuses its own flavor into the seco, resulting in a softer more subtle but very flavorful stew for the goat, and a much bolder flavor for the lamb. To further explain the difference in taste think of it in terms of the wine you would drink with it: a nice Oregon Pinot Noir would go perfect with the goat stew and a flavorful Washington Cabernet would go with the lamb stew. Of course I did not use exactly the same ingredients and spices for the lamb stew as I did for the last seco de chivo; this time I used a combination of beer, wine and naranjilla juice, while I used just chicha and naranjilla juice for the goat stew; there are also a few differences in the spices and herbs that were used, for example with the goat stew I used only cilantro, but for this lamb stew I added some parsley and oregano. For more details on the goat stew or seco de chivo, as well as some background information on some of the ingredients including panela, naranjilla and chicha you check out that post. I really prefer to cook secos using meat that has bones in it, they give the stew a lot more flavor, but my husband doesn’t really like the bones, even though the meat is so soft that you can just peel it of the bones, and of course I think that one of the best parts of a seco is sucking the bones at the end, but I try to put in a few boneless pieces to keep him happy, you can ask your butcher for a combination of meat with bones and boneless based on your preferences. In Ecuador secos are almost always served with rice, which really helps soak up the delicious sauce, boiled or fried yucas, pickled red onions, avocado slices, a small salad and hot sauce. Can I prepare this lamb seco in a crockpot on low? Yes, it works well in the crockpot. Hi, I don’t consume alcohol, what can I substitute the beer and white wine with??? If you can find chicha de jora (fermented corn drink) you can use that, if not regular broth (chicken/beef) and additional naranjilla juice. You are amazing!!!!! I grew up with all these Ecuadorian dishes you have on your site. I’m am blown away with how incrdibly simple you keep things, and how amazing the food comes out! Also, your descriptions and instructions are soo precise and accurate. I’m am eternally grateful to you! Thank you soooo much!!! You are my hero!!!! I’m curious what’s on the side besides the rice and vegetables. It looks delicious. Thanks for the great recipe, I absolutely love it, so easy and so good too! I have made it 2 times already and I love it. Thanks for sharing this with the rest of us, I admire your skills and love for Ecuador and its food. Thank you! Another favorite Ecuadorian dish. I wish there were some good Ecuadorian restaurants that serve this type of food. For the most part they focus on guatita and hornado but don’t venture into some of the more traditional dishes I was accustomed to eating when I was young. I made this last night. It was delicious! I had fun throwing all those ingredients together. I ended up substituting the naranjilla with orange juice, but next time I will try grenada. I love the subtle flavor the achiote adds. If at all possible, I suggest griding actual annatto seeds to make the aciote powder, it’s sooo much better. Thanks for this! You are a master chef! Every picture is mouthwatering and your recipes are compelling. Equadorian food is brand new to me and your blog has been a beautiful introduction. Thank you! 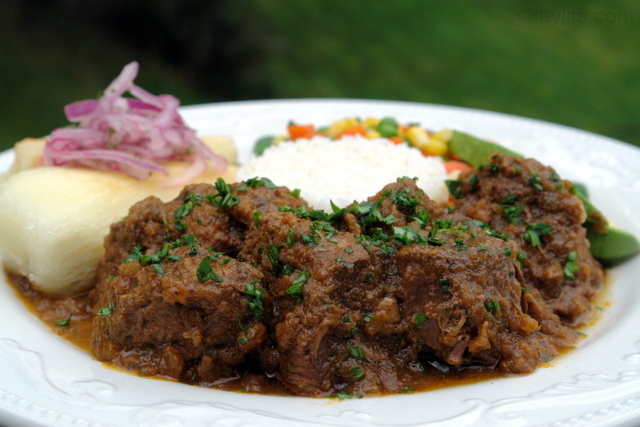 Seco de Chivo brings back memories of my father who is Ecuadorian. He would spend hours in the kitchen making this recipe. It’s my favorite and now I will make it for my family as a tradition. getting more hungry with every picture i see. How come I just found out about this site/blog. just when I thought I had seen the best food sites/blogs I needed to know about, I now learn that I have seen less than 1%. I guess I don’t know and should embrace learning about more and new. I’m in the UK and cannot find any naranjillas, fresh or frozen. Is there an alternative I can use. Hi Tim – you can use passion fruit juice instead or tamarind juice also works well. If the juice contains sugar you’ll probably want to leave out the panela, but taste it and adjust according to your preference. wow. that’s an amazing plate of comfort food. love that stew. it has the right consistency and looks so flavourful! Mmmm….seco is one of my favorite things about Peru. This Ecuadorian one looks delicious too! Yum!! !